Don't lose your message amongst the details. Don’t lose your message in the details. When it comes to focus and marketing, it is easy to let the details overwhelm your message. The humorous picture that accompanies this story makes a great example of how easy it is to lose the point among too many details. While the picture has lost its own history, the point it makes is timeless. Too many websites are like this sign. Extraneous details, while possibly informative, overwhelm the true marketing message of a webpage. Provide too many details your prospective customers might not even hear what you really wanted to tell them. We’ve all seen them, those websites that have words and pictures on every available pixel. Their marketing message becomes difficult, if not impossible to find amidst the chaos. Look a little harder and it becomes clear that many of these sites fail to have a focused marketing message. Don’t fall into that trap with your site. If your site is supposed to be selling your product or service; make sure your message is clear. Have a friend or relative look at the site. Don’t tell them why you put that cool picture in the middle of the page. Let them tell you if it adds value. If they ask what’s the picture of or for, you know you need to evaluate its usage and the copy surrounding it. 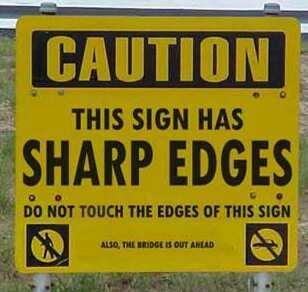 This sign, while it does have a clear message, “Beware sharp edges!”, the important message, “The bridge is out!” has become secondary and is easily missed. What should your marketing focus be? Think about this a little differently. Suppose your store is hard to find, but you are the only place in town that sells a particular item. Which is the more important marketing message; “Conveniently located one block from the Walmart Plaza” or “We are the only store in the county to carry Item X”? While both are important, the second sentence should be the focus of your advertising. The first sentence is merely a detail. Keep your primary marketing message focused and to the point. You will still want to include the details of what your business has to offer and how people can contact you. Details will ultimately close the sale. But, you’ll never convert prospects into customers if they can’t figure out what you have to offer them.